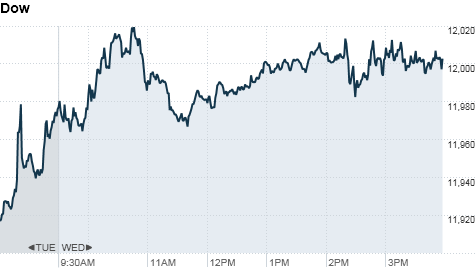 NEW YORK�(CNNMoney) -- Stocks held onto gains Wednesday afternoon, with the Dow and S&P finishing at their highest levels since the summer of 2008, after the Fed kept rates steady and left its bond-buying plan alone. The Dow finished up 8 points, or 0.1%, at 11,985.44, the highest close since June 19, 2008. Earlier in the session, the Dow rose as much as 43 points, or 0.4%, to 12,020.52, hitting its highest intraday level since June 20, 2008. However, the index is still far from its all-time highs above 14,000 reached in October 2007. The S&P 500 (SPX) added 5 points, or 0.4%, to close at 1,296, its highest level since August 28, 2008. The broader index had reached as high as 1,299.74, but failed to break above the key resistance level of 1,300. Meanwhile, the Nasdaq (COMP) gained 20 points, or 0.7%. President Obama's State of the Union address late Tuesday helped push stocks higher from the open. "The speech last night created a more business-friendly environment," said Michael Sheldon, chief market strategist at RDM Financial Group. "He emphasized working with businesses to promote investment and jobs, whereas a year ago the White House was criticizing financial institutions." Sheldon said a better-than-expected report showing new home sales jumped to an 8-month high in December also added support. Later in the day, the Federal Reserve announced its unanimous decision to leave interest rates unchanged near historic lows and continue to move forward with its $600 billion bond buying program to stimulate the economy. In its first meeting of 2011, the central bank also said it remains cautious about the economic recovery. "The Fed gave us exactly what we were expecting," said Doug Roberts, chief investment strategist at Channel Capital Research and author of Follow the Fed to Investment Success. "They noted that there has been some improvement in the economy, but high unemployment trumps all of that." On Tuesday, stocks closed mixed after staging a late comeback. Companies: Toyota (TM) announced it is recalling more than 1.5 million vehicles worldwide for issues that could result in fuel leakage. News of the recall sent shares of the automaker 1.9% lower. Shares of home improvement retail chain Lowe's (LOW, Fortune 500) edged up 1.1% after the company said it is cutting 1,700 managerial jobs while adding up to 10,000 part-time workers in order to better staff its stores for weekend shoppers. Shares of online content creator Demand Media (DMD) rose 33% Wednesday as the company made its public debut, raising $66.5 million in an IPO that valued the company at more than $1 billion. Shares of media conglomerate Nielsen (NLSN) were up 8.7% as the company also made its public debut. Xerox (XRX, Fortune 500) was the biggest loser on the S&P 500, with shares dropping more than 7%. The company issued a disappointing outlook and announced its Chief Financial Officer Larry Zimmerman will retire next month. US Airways (LCC, Fortune 500) posted its first quarterly profit since 2006 and widely beat Wall Street forecasts, lifting shares of the airline by 6.6%. Shares of Yahoo (YHOO, Fortune 500) slipped 2.8% after the company reported quarterly results late Tuesday that missed expectations and announced more layoffs. Eastman Kodak's (EK, Fortune 500) stock sank almost 18% after the company posted a fourth-quarter profit that plunged 95% from a year earlier. Revenue dropped 25% and missed expectations. World markets: European stocks closed higher. Britain's FTSE 100 climbed 1%; the DAX in Germany surged 0.9%; and France's CAC 40 rose 0.7%. Asian markets ended mixed. The Shanghai Composite gained 1.2% and the Hang Seng in Hong Kong edged up 0.2%, while Japan's Nikkei slipped 0.6%. Currencies and commodities: The dollar edged lower versus the euro and the British pound. It was slightly higher against the Japanese yen. Oil for March delivery edged up $1.14, or 1.3%, to settle at $87.33 a barrel. Gold futures for February delivery rose 70 cents to settle $1,330.00 an ounce. After rallying for seven straight session, cocoa prices softened Wednesday, slipping 0.2% to 3,330 per ton amid a one-month export ban in the Ivory Coast, the world's largest cocoa supplier. Earlier in the session, prices rose 1.5% to 3,385 per ton. Meanwhile, cotton futures climbed to an all-time high, rising 3.9% to $1.68 per pound. Bonds: The price on the benchmark 10-year U.S. Treasury fell, pushing the yield up to 3.43% from 3.32% late Tuesday.